Notes: John & Yoko welcomed a film crew from Austria who filmed them over two days for a TV documentary on the couple, although Yoko was the intended focus of the special. On the first day they accompanied John & Yoko to the filming of "The Rolling Stones Rock and Roll Circus" spectacular in which the Austrian crew filmed the performances of "The Dirty Mac" as well as some non performance material. Parts of this were used in their documentary "John Lennon & Yoko Ono", aired in March 1969 in black and white. 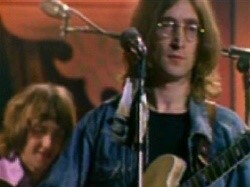 However some colour footage from the filming was used in the December 1980 Austrian documentary called "John Lennon: A Piece of His Mind". 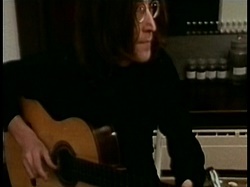 The next day(Dec 12) the film crew went to John`s home "Kenwood" in Weybridge and shot some more footage including (possibly, see next entry) a sequence outdoors with John playing acoustic guitar performing a new song called "Everybody Had a Hard Year". 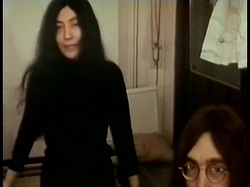 Inside the house they filmed Yoko describing some of her artwork while John doodled on his guitar in the background. It was screened on Austrian TV in March 1969 in black and white although it was all shot in colour. Some colour snippets from this special have more recently turned up in the 2003 BBC Arena documentary "Imagine Imagine" and the entire black and white documentary broadcast has found its way onto bootleg in average quality.